Frank Martin: I'd like to do some sight-seeing. Pilot: This plane isn't for tourists. Frank Martin: I'm not a tourist. Q: What are the differences between the PG-13 theatrical version and the French uncut version of this movie? Q: Did Wall Street die? A few bumps mar an otherwise decent outing in "The Transporter"
There's no question that Luc Besson is one of Europe's biggest action producers. I mean with the cult classics "La Femme Nikita" (1991) and "The Professional" (1994) behind him, he's basically been given the green-light for every big action picture he comes across. One of his latest and most ambitious projects was "The Transporter," released in 2002. I have to admit this is one flick I approached with a very open mind - very open. I mean, I like Jason Statham. I think he's a pretty cool guy and at first, even I questioned his casting as Frank Martin in "The Transporter." But the problem is, and I'm assuming this is the result of the quickly edited action scenes (which were toned down to make the film "PG-13"), he's not being given the room to really be the best he can be. As the lead character, he's a transporter. He can get you, your associates or your property anywhere, anytime, on time, no questions asked. But you know what? Common sense tells us that it was curiosity that killed the cat, and the cat in this picture thankfully doesn't die some horrible death but instead, curiosity yields him a break - a beautiful woman named Lai (Shu Qi) - bound and gagged, and in the trunk of his BMW. It's not spoiling much that she and Frank get together and as a result, are forced to do battle with shady and vicious American businessman Wall Street (Matt Schulze) and his army of high-kicking, disposable assassins. There's a little more to the plot and Lai, and the circumstances surrounding her appearance in the trunk of Frank's car, and it involves some smuggling of poor Chinese immigrants from China to Europe, where much of the action takes place. Speaking of action and there's plenty of it, Statham does display some pretty impressive moves but the frantic editing just doesn't do him justice. He obviously worked out for this part and there are frequent moments when his ripped torso is on display. He also (barely) manages to shy away any possible accusations that he's just a British novelty to American audiences. Director Corey Yuen (whose work on Jet Li's 2001 action film "Kiss of the Dragon" I admired), is behind it and Besson's got a producer credit. The problem may not be Statham because I think he's a really cool actor with a raspy British accent, but the script is worth some deeper examination by more thoughtful minds. There are plenty of holes and unanswered questions (i.e., the extent of Frank's military training and experiences, Lai and how she wound up with Frank and her quarrelsome relationship with her father who is played by Ric Young, and the plot with the Chinese smuggling). But why am I making such complaints? 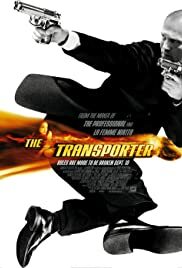 "The Transporter" is an action movie; no plot required. Despite some bumps in the road, "The Transporter" is pure action fun from beginning to end, and I got my free ticket to see "The Transporter 2" on Friday.